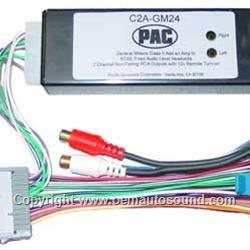 The C2A-GM24 allows you to add a 2 channel aftermarket amplifier for GM vehicles with Class II data bus. What makes the C2A-GM24 unique is that is takes the fixed level audio signal from the factory head unit before it gets to the Bose® amplifier and gives you a variable output. The C2A-GM24 outputs are digitally controlled by the head unit's volume knob. You get full range audio signal, not a Bose® specific equalized output, high passed or low passed output. • 2 channel RCA outputs with left and right level adjustments for matching aftermarket amplifier/speaker audio signal to factory speakers. • User selectable to fade out when adjusting factory radio to front or to rear. Or select to be non-fading output. • +12volt remote turn-on output. • Plug & Play, no hard wiring required. The C2A-GM24 does not replace the factory amplifier. If the factory amplifier is removed or disconnected, the C2A-GM24 will not function.